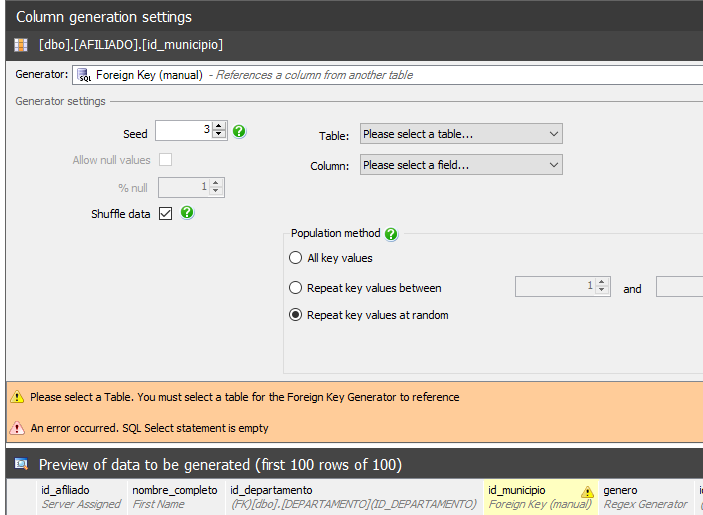 How to generate a foreign key that respects the referential integrity? I need to generate information for a column whose foreign key depends on another column of the same table (previously generated). How can I ensure that the referential integrity of the generated information is respected in the generation process? The Product code was generated correctly with reference to the product table, but the SUB-PRODUCT CODE must belong to the set of sub-products related to the PRE-GENERATED PRODUCT CODE. 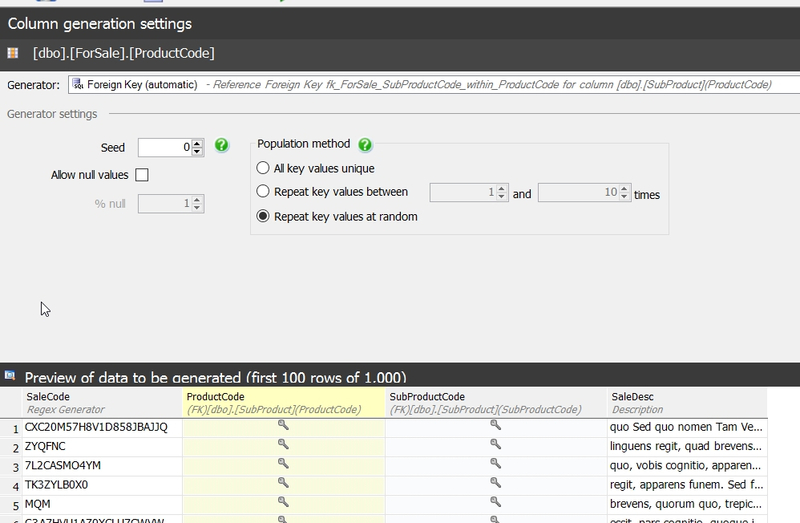 There are no primary or candidate keys in the referenced table 'dbo.SubProduct' that match the referencing column list in the foreign key 'fk_ForSale_SubProductCode_within_ProductCode'. The FK in ForSale needs to match the PK in SubProductCode. Both SubProductCode and ProductCode should be in the PK. The ordering needs to be the same. However, if you have this DRI setup, then Data Generator will recognize the FK relationship and choose that. Since the FK will be on product and subproduct, the data will match. 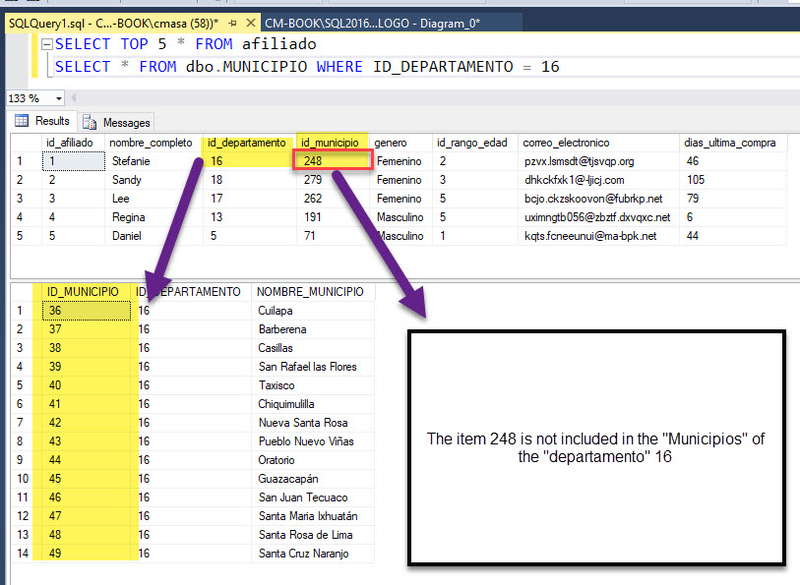 Can you provide more schema DDL and sample data that explains this? Is this a compound FK? 4. the situation is that when I generate information for the tabal "AFFILIATE" the department is generated OK, but the municipality generated does not belong to the related department. Lo can be seen below. 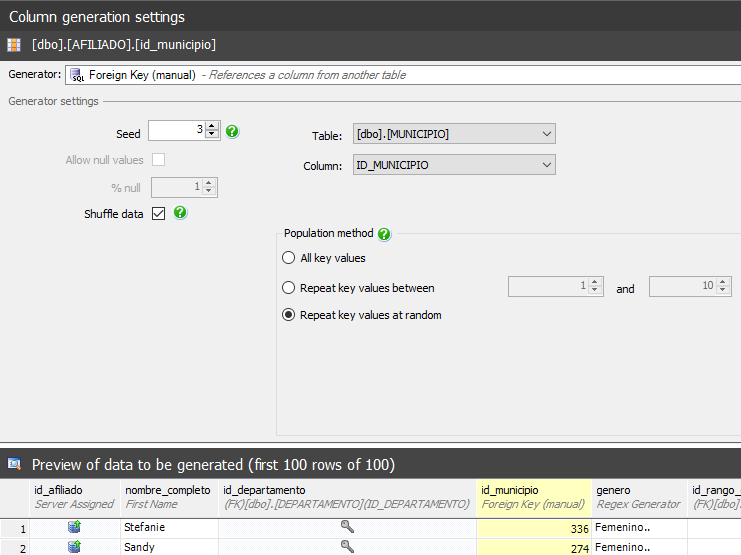 finaly, this is the way as i'm generating the information in RedGate. You don't have correct DRI. 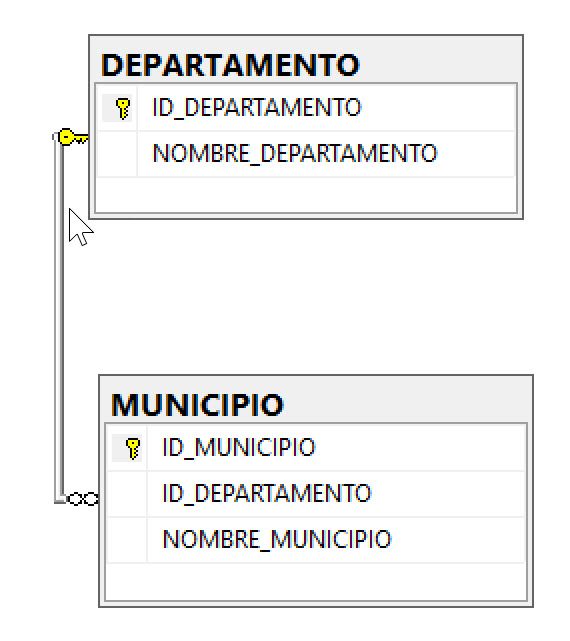 If you want to constrain the data in Affiliate, your Municipio should have a PK on both IDDepartmento and IDMuicipo. You are asking them to both be a FK, but you haven't declared that. There's no definition of that relationship in your diagram. Make the suggested change in the composite keys scheme, but I do not work as I wished, next the changes in the database..
sorry, this is the correct picture. 1. Keys composed in the definition of the table "Municipalities", as you indicated. Assuming the following table structure, the FK you would need is in the last lines of code. Is this what you need? 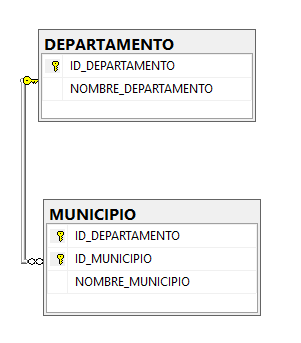 Refresh the schema in data generator. If you've saved the changes, not just made in the diagram, it should pick those up.